Unrepentant book thief Gilkey has stolen a fortune in rare books from around the country. Yet unlike most thieves, who steal for profit, Gilkey steals for love—the love of books. Perhaps equally obsessive, though, is Ken Sanders, the self-appointed "bibliodick" driven to catch him. Sanders, a lifelong rare book collector and dealer turned amateur detective, will stop at nothing to catch the thief plaguing his trade. 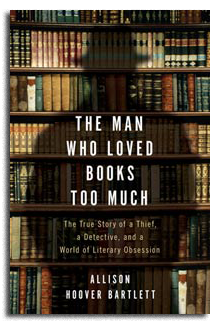 In following both of these eccentric characters, journalist Allison Hoover Bartlett plunged deep into a world of fanatical book lust, and ultimately found herself caught between the many people interested in finding Gilkey's stolen treasure and the man who wanted to keep it hidden: the thief himself. With a mixture of suspense, insight, and humor, Bartlett has woven this cat-and-mouse chase into a narrative that not only reveals exactly how Gilkey pulled off his crimes and how Sanders eventually caught him, but also explores the romance of books, the lure to collect them, and the temptation to steal them. All collectors have stories of what first made them fall in love, and Gilkey and Sanders are no different. Bartlett puts their stories into the larger context of book passion, collection, and theft through the ages. Immersing the reader in a rich, wide world of literary obsession, The Man Who Loved Books Too Much exposes the profound role books play in all of our lives, the reverence in which these everyday objects are still held, and the craving that makes some people willing to stop at nothing to possess the books they love.